My dog Scout is a little bit quirky. Well, okay, maybe more than a little bit. One of her idiosyncrasies is that she won’t “go” in the yard. I suppose she would if she really had to. But she much prefers to do her business elsewhere. I humor her in this regard. We walk on the beach a lot, as any of my Instagram followers will confirm. But we also take a lot of walks around our neighborhood. We live downtown, so depending on the direction we amble, we can cruise State Street, hit Alice Keck Park gardens, or just travel in circles on the streets near our house. Maybe she’s spoiled, but there are worse hobbies for both of us than walking around the neighborhood. That’s how I discovered Euclid Avenue, a quiet, hidden one-block street between Victoria and Sola, tucked behind the Westside Community Center, off Castillo, next to the freeway. And that’s how I discovered 415 West Sola Street, which is actually on the corner of Sola and Euclid. 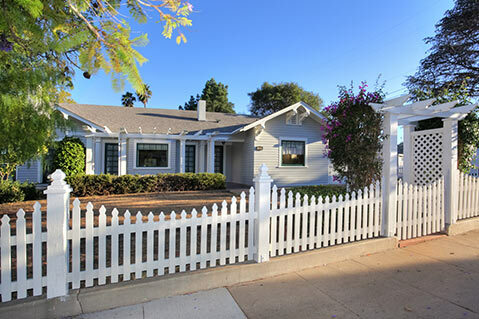 It has a white picket fence surrounding its large lot, with the front door on Sola Street but the side gate and garage on quiet little Euclid. Walk through the gate up to the front door, and you’ll find plenty of surprises. The house was built in 1918. It’s a California cottage with the wide front porch of many craftsman bungalows and plenty of details reminiscent of that era such as built-in bookshelves, charming fireplaces, gleaming hardwood floors, and original ice-box-style shelving in the kitchen. It also offers many bonuses that have been added over the years: a large enclosed porch on the back of the house, a stairway up to a huge finished attic, and a big basement that adds two extra rooms that can be used as workshops, studios, or whatever your imagination allows. The current owners of this home have lived in the house for 50 years, so there are also many subtle touches that were lovingly added by their family: stained glass windows, a unique embellished fireplace screen, vintage wallpaper, and more. There’s even a secret panel in the study that hides a mysterious cubby space behind one wall, and a covered pass-through window between the dining room and the kitchen. The property is almost a quarter acre, and is zoned R-4, so the new owner may be able to add another unit or expand the house even more. But whether one sees this four-bedroom, two-bath home as a quirky fixer-upper or a treasure from a bygone era just waiting to be restored to its former glory, I hope that someone who appreciates this home’s storied past and current charm, as well as its future potential, will decide to buy it and cherish it. Scout and I will be walking by regularly to watch and see. 415 West Sola Street is currently for sale in Santa Barbara, listed by Tim Johnson of Keller Williams Realty. Reach Tim at (805) 403-6323.